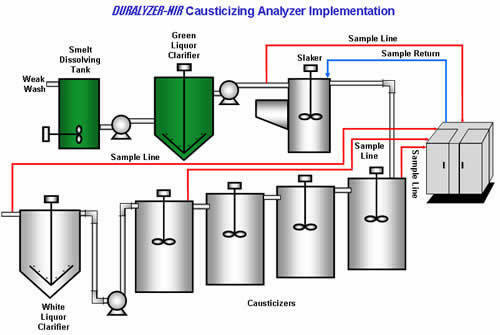 The Causticizing Liquor Analyzer Solution is a turnkey application for carrying out white and green liquor analysis at strategic locations throughout the causticizing process. The standard configuration supports four sample lines including sample points from the green liquor to the slaker, the 1st causticizing tank, the last causticizing tank and the white liquor clarifier. Utilizing a series of industrial spectrometers, white and green liquor analysis provides measurements for Total Titrateable Alkali(TTA), Active Alkali(AA) and Effective Alkali (EA). The DURALYZER-NIR used in the solution will calculate and display all of these individual chemicals. The analyzer package consists of an industrial spectrometer configured for white & green liquor analysis, an acid cleaning system to remove scale buildup from the sampling optics, and all the necessary sampling hardware to collect white and green liquor from the process. Samples are then brought into the system with ½” Teflon tubing or equivalent and a ¾” EPDM hose. Sampling and cleaning is completely automated and is controlled by the spectrometer and sampling system microcontroller. Reliable and accurate green liquor analysis is important for optimizing lime usage in the slaking process. The green liquor sodium carbonate (Na2CO3) level needs to be accurately calculated to ensure the addition of the correct amount of lime. The two primary sources of variation that interfere with this processcontrol are lime quality and green liquor variations. Yet knowing the green liquor composition, one source of variation is eliminated in the mill. With the online analyzer, the green liquor is trimmed in real-time to meet target total titrateable alkali (TTA) or Na2CO3 levels. Then the lime feed rate only depends on the green liquor composition, thus leading to reduced variations in lime screw speed. Alternatively, variations in green liquor composition and green liquor flow can be used to determine the required lime addition rate. Both of these approaches require an accurate online analysis of the green liquor entering the slaker.